This tutorial assumes that you have some understanding of Webpack, Babel, ReactJS and an experience of creating Node.js applications. To learn more about Webpack please view its concepts, and a simple tutorial on it. To understand more about ReactJS view this tutorial. The greatest advantage of Webpack is that it removes the tedious use of numerous <script> tags within HTML since all all JS libraries are called with require()and import , thus facilitating cleaner front end code. Moreover, it initiates Babel to run in a manner configured by the user to convert from JSX to JS when necessary. With a bit of understanding under our belt, let’s get coding! You may clone this Github repo to follow along. The repository is committed on the basis of checkpoints that are mentioned within the tutorial. You may use git checkout to jump between the different checkpoints of the code. Run the following commands to set up the repository. Notice how bundle.js — the script with compiled (JS & ES5) ReatJS code is located after <body>. This is kept so intentionally in order to load the html document first and then execute ReactJS. Keeping bundle.js before <body> will cause a ReactJS error to occur. 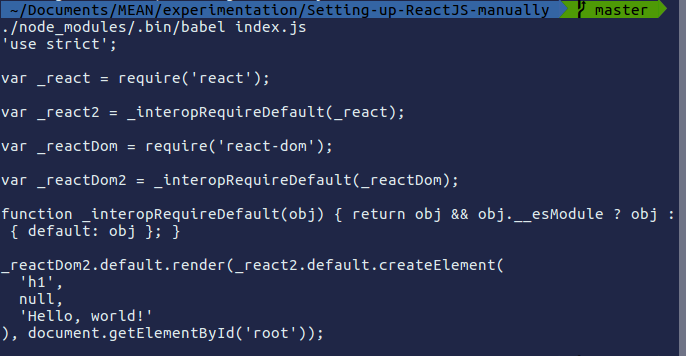 Now set up Babel to perform two compilations: From JSX to JS and from ES6 to ES5. JSX to JS conversion is necessary as browsers don’t support JSX natively and the conversion from ES5 to ES6 is necessary is due to the fact that some browsers still don’t support ES6 syntax entirely. Test: run $ ./node_modules/.bin/babel index.js from the root of the package and a compiled version of index.js should be displayed on the command line. Also, notice how we use the --save-dev flag rather than --save . This is done because Babel is a development environment dependency rather than a project dependency. For more information view this article. We now move on to implementing Webpack within our application. As you saw before, Babel successfully allowed us to transpile ES6 JSX into ES5 JS. Now we will use Webpack to redirect this transpiled output according to our needs via a Webpack configuration file. On running npm run build , the Webpack process will run according to the configurations presented in webpack.config.js and create bundle.js . Now that everything is set up. We just need to run the code! We’ll use the http-server npm package as a ready made server to serve our minimal web application. Install the package as such: $ npm install http-server -g (you will have to prefix this with sudo on Ubuntu) and run it with: $ http-server in the root of your package. Congratulations! 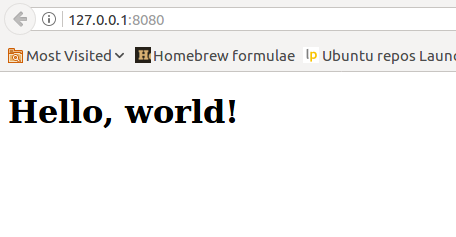 You just set up your ReactJS environment!